BAE Systems flight controls will manage the new 777X wing with load alleviation, advanced high lift & folding wingtips for superior flying quality & fuel efficiency. 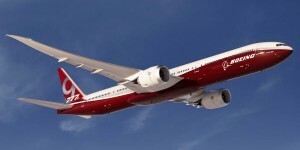 The Boeing Company has selected a BAE Systems-led team to provide electronics for the 777X flight control system through a competitive procurement process. The system, known as the Integrated Flight Control Electronics and the Air Data Reference Function, will control the flight surfaces of the aircraft and integrate additional functionality unique to the 777X. BAE Systems is teaming with Rockwell Collins to bring this world class capability to Boeing. Both companies have a strong record of executing complex development programs and are major suppliers to Boeing across its portfolio of airplanes. BAE Systems and Rockwell Collins are also suppliers of the primary flight control electronics and Autoland systems for the current 777 platform. The 777X is Boeing’s newest family of twin-aisle airplanes that builds on the passenger-preferred and market-leading 777. It was launched in November 2013 with 259 orders and commitments from four customers. The largest and most-efficient twin-engine jet in the world, with 12 percent lower fuel consumption and 10 percent lower operating costs than the competition, 777X is scheduled to begin production in 2017 and first delivery is targeted for 2020. BAE Systems’ flight control electronics will manage the aircraft’s all new wing with load alleviation, as well as its advanced high lift and folding wingtips. A recipient of Boeing’s 2011 Supplier of the Year Pathfinder Award, the company provides a large range of products for Boeing’s military and commercial aircraft. BAE Systems’ relationship with Boeing has evolved for more than 60 years, from developing the first weapon control for the F-4 jet fighter to providing avionics and control subsystems for its commercial and military airplanes. BAE Systems is a world leader in high-integrity flight and engine controls, and cabin and flight-deck systems. Every second, a flight takes off enabled by the company’s flight critical systems. Development and production of the flight control electronics will occur across multiple BAE Systems and Rockwell Collins sites.